Vancouver’s Archbishop Michael Miller provides the catechesis talk. Ordained to the priesthood by Pope Paul VI in 1975, he became the Archbishop of Vancouver in January 2009. In addition to working in Rome in the area of education, he is a specialist on the papacy and modern papal teaching, having published seven books and more than 150 articles. Following in his area of expertise, Vancouver's prelate looked to Pope Benedict XVI's teachings for his catechesis and drew from his homilies, messages and discourses. 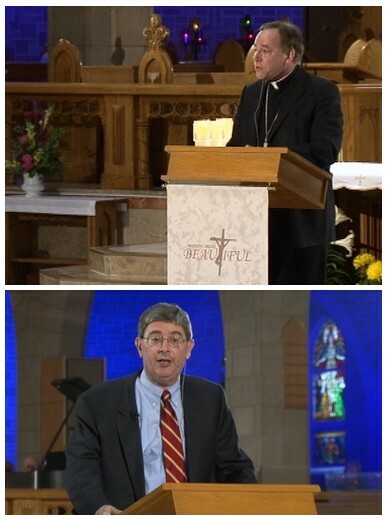 The witness talk is given by Catholic theologian George Weigel. One of America's leading public intellectuals, he is a Distinguished Senior Fellow of the Ethics and Public Policy Center in Washington, D.C., an institute dedicated to applying the Judeo-Christian moral tradition to critical issues of public policy. He is the author or editor of 20 books, including Witness to Hope: The Biography of Pope John Paul II. Weigel's excellent talk not only reflects on his experience as a Catholic, but he also shares other touching witness stories -- a German baroness who had a powerful experience at World Youth Day in Paris, a Nashville Dominican who explained her decision to enter religious life, and his daughter, who recently suffered the loss of her husband. Intermixed with reflections and comments on John Paul II, it's a talk you don't want to miss. Join us on Saturday, April 24th at 9pm ET, or Tuesday, April 27th at 8:30pm ET for Nothing More Beautiful: Jesus Christ -- Crucified and Risen Lord.